The singer is part of the 1 KM Action campaign aimed at helping students in the African country. Rihanna's Clara Lionel Foundation has teamed up with bike sharing company Ofo to provide girls in Malawi with bikes to help them get to school. The 1 KM Action campaign will give hundreds of Malawian girls the ability to travel to school. The foundation reports that poor transport links are one of the major factors in why just 8% of Malawi's 4.8m students fail to finish secondary school. 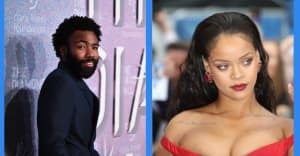 "I'm so happy about the Clara Lionel Foundation's new partnership with Ofo because it will help so many young people around the world receive a quality education," Rihanna said in a statement. "And also help the young girls of Malawi get to school safely, cutting down those very long walks they make to and from school all alone." Rihanna visited Malawi in June alongside the Global Partnership for Education to discover how she could help build a better educational future for Malawians. Last month Rihanna met with French President Emmanuel Macron to discuss the role France can play in Clara Lionel's efforts to help improve education for some of the world's poorest children.